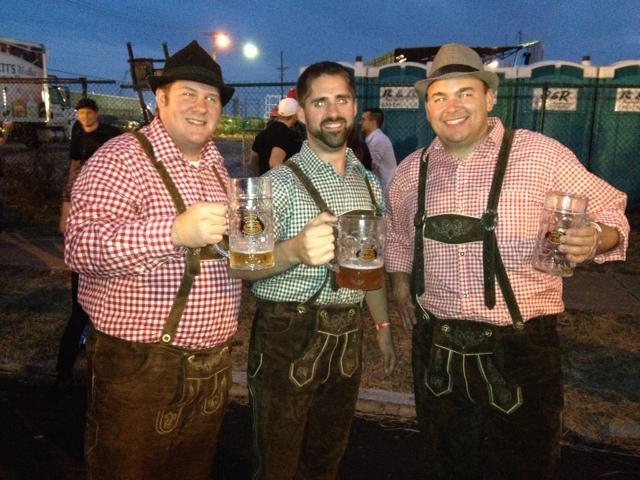 The Soulard Oktoberfest is truly one of America’s best Oktoberfest celebrations that I have visited. The only place they really lose points in is the authenticity of the decorations at the event. The Soulard Oktoberfest is hosted in the Soulard neighborhood of St. Louis. The grounds end up being a two block section around 3rd and Lafayette. Transportation to the event was very easy. I ended up staying at the Hyatt in Downtown St. Louis right across from the Arch and they had a free shuttle service that was running about every 20 minutes or so and picking up from a number of hotels and popular attractions in the area. The shuttle service ran into the night and for a little bit of time after the event to make sure everyone got to and from safely. In addition, there looked to be an ample amount of parking on site if you needed it. When you arrive at the event there are three entrances for you to choose. Admission is $5 unless you are wearing Oktoberfest-worthy outfits then you get in free. Also, right at the gates you can purchase a plastic Soulard Oktoberfest Maß for $5. Like I mentioned before, the grounds for the event were pretty big but it really didn’t feel like it because there were a good amount of people at the event. There were four stages for entertainment and at any point of the day you were able to listen to real, good, German music which I thought was a definite plus. In addition, they also flew in German rock band, Dorfrockers to entertain the crowd and they did an incredible job. Sadly, the videos I took were subpar but I’ll still have them posted below. Everyone who comes to this event should be able to find at least one band that will entertain them since there are a number of options. The beer for the event was fantastic as well. There were a number of different options including German and American. Paulaner, Becks and Kulmbacher provided a great German addition and Paulaner even offered their Oktoberfest Wiesn bier which really brought me back to Germany and Munich’s Oktoberfest. Beer refills were reasonable priced; $6 for 16 ounces, $12 for a Maß. The beauty of the Maß was they tended to overfill past the one liter line so there was a free beer bonus. The food for the event was delicious and plentiful offering almost everything you would actually see in Munich. Bratwurst and pretzels were a given for any American Oktoberfest but they brought out German delicacies that are a staple of Oktoberfest including Hendl and Schweinshaxe. As it seems to be tradition for me, I only had a bratwurst at the event and didn’t eat anything else. I seem to focus more on the beer and entertainment than the food which is something I will try and improve upon next year. But of the people I talked to who had the food they seemed very pleased. As I have said before, the only problem I had with the event was the lack of decorations. Luckily, the weather was beautiful when I went because had there been rain there would have been very few places to hide. There were only a handful of tents with seating for the event. The majority was just an open area for the bands. Of the tents that were there they were decently decorated. 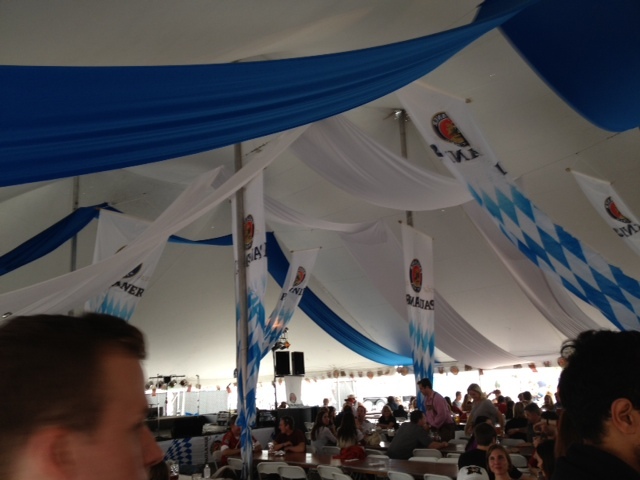 The Paulaner tent had a number of Paulaner flags and streamers but nothing too spectacular. A good way to get around the seating problem was buying the VIP pass since they had their own tent. It will be an option I will choose for the next time I visit. All in all though, Soulard really hit it out of the park. I have to say, I have been to a number of Oktoberfest celebrations this year and this one tops them all. The combination of great beer, food, and entertainment made for a delightful day and the people I met were also very nice and a lot of fun. 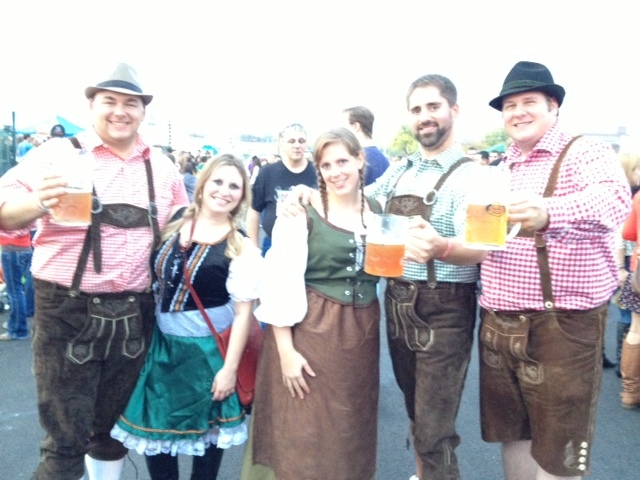 A good amount of people dressed the part and the Oktoberfest atmosphere was highly present in Soulard. This will definitely be an Oktoberfest I will attend again. 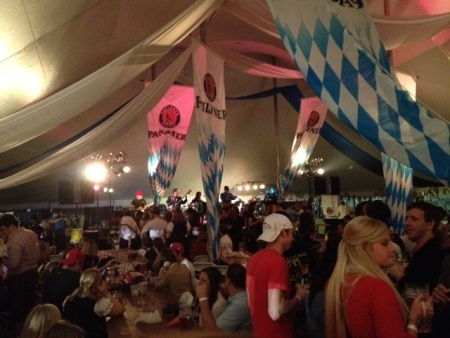 Thanks again Soulard to ending my 2012 Oktoberfest season with a bang!